Based out of the University of Toronto, the BRIDGES Collaborative supports a portfolio of 35 publicly-funded programs focused on delivering healthcare innovation. Tasked by Ontario’s Ministry of Health and the Ontario Medical Association to support the cohort with research, coaching, and evaluation, the BRIDGES team needed a digital solution to help them speed up the the learning cycle. Programs in the BRIDGES Collaborative are all working on the same problem: how to improve outcomes for medically complex patients. The programs draw on similar strategies, resources and patients for a common cause, but have little time or opportunity to share their learnings along the way. The BRIDGES team hired Thicket to build a solution to enable responsive learning throughout the network. 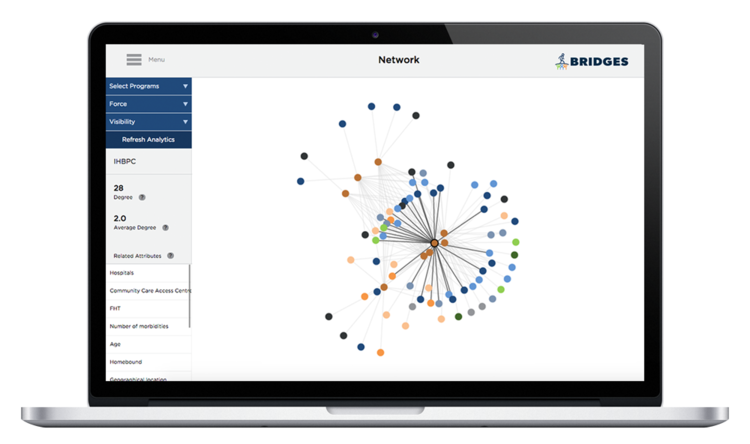 Thicket Labs designed a collaborative leaning dashboard for the BRIDGES programs to efficiently share insights about their programs as they evolve over time, surface network-wide trends, and identify opportunities for deeper knowledge sharing. The dashboard aided Collaborative members to connect with each other more effectively, provided the BRIDGES team with system-level insights, and supported more informed funding decisions over time. 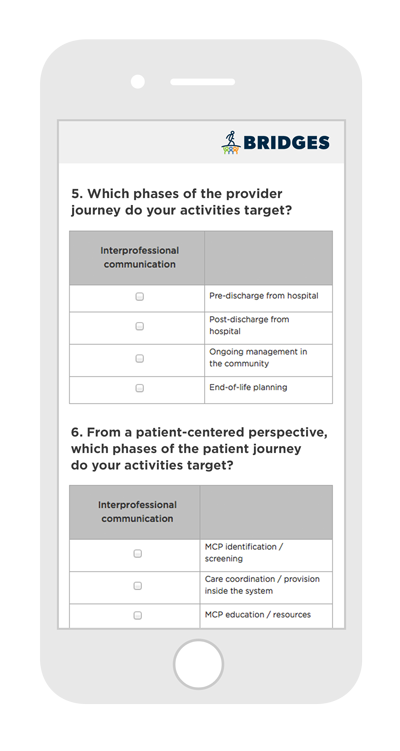 The dashboard included a survey, visual insights, and monthly reporting to measure results from the Collaborative over time. The BRIDGES team used the dashboard to replace a 200-page report produced over six months of work by a full-time researcher. An 11-question survey replaced hundreds of hours of coordination, conversations, and analysis. The survey is updated monthly with real-time visual insights, compared to a six-month production cycle for a much less accessible report. After an initial customization process, the dashboard and Thicket’s collaborative intelligence APIs required a modest licensing fee, saving the BRIDGES team a staggering 85% on existing costs. 35 Collaborative members served with an 11-question survey, requiring 8 minutes to take. Dashboard replaced six-month research and reporting cycle with real-time insights, saving 85% on existing costs. The BRIDGES Collaborative presented dashboard insights and visualizations to the Ministry of Health to support investment recommendations.